"Original 64 patches and 1 complete Special Setup for the Roland JD-800. 16 Lead patches, from screaming leads to mellow tones. 8 Bass patches with fat, depth and fullness. 12 Pad patches for multi usage backgrounds or even solo for composite material. 4 String patches emulating and carefully programmed to sound similar to the famed Strings card. 8 F/X patches of special effects, with emphasis on usability, not just meaningless resonant beeps. 16 Pulse Sequence patches similar to an arpeggiator, only more complex and even more fun to use. By combining common usage that exists on these 3 cards, it’s possible to create a full drum map across all 61 keys that ensure a wide mix of usable drums for your mixes. Careful and intrinsic programming ensures the highest quality in audio. Some patches have taken years to develop to maturity. An example of this dedicated algorithmic programming, it’s possible to achieve a split keyboard with TWO completely different sounds with ONE partial! Something special with this set of patches are the 16 creative Pulse Sequence patches. Especially created for use in single mode, offers versatile performance playing. - Play a chord with the left hand and strike a melody with your right hand, it plays along perfectly. - Use both hands to hold chords and listen to the evolving landscapes the sequences offer. - Change the tempo using the LFO sliders - customize instantly to your playing style. What’s more, each patch offers easy alterations of the design, the partials are pre-selected for easy editing! 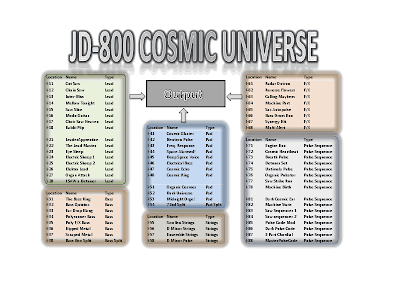 Along with the purchase of the patches is a full patch list (PDF file) which you can use to reference to creating complete songs using the 6 part multitimbral capabilities of the JD-800. At such a cheap price - what have you got to lose? Don’t risk cheating yourself from pure inspiration of playing and delving into deeper programming that these patches can offer you. PayPal is the preferred method of payment. This is for our mutual protection against fraud. However, I do accept other methods of payment. After purchase and confirmed payment, you will receive e-mail (within 1 day / 24 hours) with attached .SYX file for use to load the patches into your JD-800. Instructions are sent via e-mail on how to do this. Also attached is .PDF file of full patch list in each category.